Posted by Madeline Patton on January 8th, 2018 at 11:00am . Nanotech research helped three Saint Paul College alumni move closer to their STEM career goals. Posted by Jessica Behrman on December 18th, 2017 at 2:25pm . This recent Pew Research Center report details the trends in technology usage among older Americans age 65 and above. Broadband internet usage and smartphone adoption have dramatically increased within the last five years, making the current generation of seniors the most digitally-connected in history. Although there is a definite uptick in technology adoption, there still seems to be a digital divide among seniors with lower levels of education and income. Approximately four-in-ten (42%) of senior adults report owning smartphones and 67% of seniors report using the internet, which marks a 55-percentage-point increase in about 20 years. Despite the increase, one-third of seniors report never using the internet, while 49% report not having broadband internet in their homes. Technology adoptions rates differ dramatically when also evaluating education and income. 87% of seniors who earn $75,000 and above report having broadband internet in their homes, in comparison with just 27% of seniors earning $30,000 or below. Around two-thirds of seniors with bachelor’s or advanced degrees report owning smartphones (65%), compared with 45% of those who have some college experience and 27% of those who have high school diplomas or less. These findings are based on several nationally representative Pew Research Center surveys. The main findings on technology adoption are from a phone survey of 3,015 U.S. adults conducted Sept. 29-Nov. 6, 2016. Visit the Pew Research Center for the full report. Posted by Madeline Patton on December 4th, 2017 at 12:00pm . A cross-discipline capstone project at the New York City College of Technology (City Tech) led students Jiaman Zhao, Mohamed Alborati, and Teddie Lai to change their career plans. At the 2017 ATE Principal Investigators Conference the three associate degree graduates exhibited the prosthetic hand with embedded sensors that they fabricated with a 3-D printer and programmed using multiple hardware and software systems. In interviews they explained the project's unexpected impact on their lives: Zhao wants to work in a hospital prosthetics department while he completes his bachelor's degree; Alborati changed his major from mechanical engineering to computer engineering; and Lai plans to be a prosthetics designer rather than enter the military as a computer technician. "Of course we are going to make it better," and "We have a lot of options," are just two of Lai's statements that sum up the students' takeaways from the ATE-funded mechatronics project (#1601522) that has computer science and electro-mechanical technology students create medical devices together. Posted by Jessica Behrman on November 20th, 2017 at 7:29am . As many of us are aware, taking summer classes can be a good way for students to accelerate their studies or lessen the credit load for fall and spring semesters. But, what if they can’t afford to do so? In a report released in August by the Community College Daily, representatives from several community colleges across the U.S. expressed relief and overwhelming positivity toward the new Pell grant expansion. The year-round Pell was previously available during the 2009-2011 academic years. Congress restored it this May, allowing it to go into effect as of July 2017, though many community colleges were not able to offer Pell grants this summer because most students had already completed their financial aid applications when the year-round Pell was approved. It seems that most colleges are ready to offer the Pell for summer of 2018. Leslie Buse, Assistant Director of Financial Aid at Northeast Iowa Community College (NICC) said that having summer Pell grants to look forward to “opens up a whole new avenue of relief for students. ” She referenced one student who had been at a four-year college, didn’t graduate and enrolled at NICC to get some job skills but is carrying a large amount of student debt. “It becomes so stressful for students trying to figure this out,” she said. The year-round Pell can especially be of use to older, working students who are enrolled in career and technical programs. Having to take the summer off means more time needed in the long run to complete a program. Sarah Armstrong Tucker, chancellor of the West Virginia Community and Technical College System said that not being able to offer the Pell Grant year-round has negatively impacted industry partners, or, employers of their graduates. “They have a need for employees all year; it’s not based on the academic calendar,” said Tucker, who emphasized the point during a Senate hearing this spring. A report released this summer by the Community College Research Center shows that summer enrollment increased by 27 percentage points for each $1,000 of year-round Pell grant funding per student. This is particularly significant since the completion rate for associates degree has shown to increase by 2.2 percentage points since the re-institution of the year-round Pell. The full report is available to read on Community College Daily's website. Posted by Madeline Patton on October 30th, 2017 at 11:00am . For years, Virginia Western Community College Automated Manufacturing Instructor Dan Horine has been searching for more affordable equipment to teach mechatronics in high schools. By the end of the Mechatronics Community Exchange (MEC) call on Friday, October 27, he was persuaded that the Low Cost Mechatronics Trainer built by Anne Arundel Community College Associate Professor Tim Callinan could be what he's been seeking. "It's amazing," Horine said. The trainer Callinan built for Team CollaborATE—an ATE project that involves Anne Arundel, College of Lake County, and Florida State College at Jacksonville—costs about $1,500 and can be used simultaneously by two students in a lab. The $7,000 cost of comparable commercial equipment has inhibited expansion of mechatronics programs at high schools and colleges. Team CollaborATE provides detailed instructions to build the trainer, which uses mechatronics' key electrical, mechanical and computer technologies. Watch the video that Callinan narrates at https://www.youtube.com/watch?v=JBGCg_1LQHw. Listen to the recording of the Skype group discussion about the trainer at https://ate.community/MCE, the Mechatronics Community Exchange microsite that ATE Central hosts for this group of ATE educators. ATE Central's Microsite Service is free to all ATE centers and projects. Its drop-and-drag interface is easy to use and accommodates photos and multi-page documents. To begin the process of creating a microsite send an email to microsites@atecentral.net. All About the ATE PI Conference App! Posted by Jessica Behrman on October 22nd, 2017 at 3:00pm . Once again, ATE Central and the American Association of Community Colleges are pleased to announce the release of this year’s ATE PI Conference mobile app! The 2017 app and companion website are designed to help attendees make the most of their conference experience. Conference participants can use their phone, tablet, or Internet browser to create a personal schedule, stay up-to-date with the agenda and speaker lineup, search the attendee directory, and more! The app is available for iPhone or iPad and Android devices. To download the app, search the app store for "ATE PI 2017" or simply follow the appropriate link from a mobile device. Each year, ATE Central gathers feedback and usage data about the app through surveys and data collected by the app itself. A review of last year’s data found that 59% of invited attendees downloaded the meeting app. This finding reflected an increase from the previous three years where 56%, 49%, and 47% downloaded the app in 2015, 2014, and 2013, respectively. Interestingly, the primary reasons why individuals do not download the app has changed over time. In 2011 for example, 46% of individuals did not download the app because they did not have the supporting devices, whereas, in 2015 that number had dropped to 8%. Moreover, only 8% of individuals indicated that they did not download the app because of lack of awareness. While a sizable portion of the population indicated that they did not download the app because they prefer printed materials (46%) the increase usage of the app has reduced printing costs for the sponsors of the PI Conference. The app is well regarded by those who use it - 97% of those respondents who used the app deemed the quality to be good, very good, or excellent. There’s a lot you can do with the app but we always look for ways to make it better. We’d love to get your feedback and we’re happy to answer any questions or help out if you’re having any problems logging in or using the app. Please don’t hesitate to contact staff at ATE Central at info@atecentral.net or stop by our booth (#002) at any one of the showcase sessions! Posted by Madeline Patton on October 9th, 2017 at 11:00am . An ATE-funded research project offers a set of tools that educators can use to start new industry partnerships and enhance existing relationships with the employers of their students. The Workforce Education Implementation Evaluation (WEIE) Framework was developed to help two-year college technical faculty members overcome "the isolation and just the constant drumbeat of work, and trying to cover everything that you've got to cover," said Louise Yarnall, senior research social scientist at SRI International. Posted by Rachael Bower on September 25th, 2017 at 8:46am . 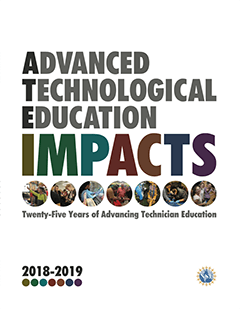 ATE Central recently had the opportunity to interview Dr. Celeste Carter, who is a Lead Program Director for NSF’s Advanced Technological Education (ATE) program. We were interested to learn more about her involvement in the ATE program as well as how she thinks the program has changed and evolved over its tenure. Dr. Carter also discusses the challenges of proposal writing, as well as three things she recommends every new grantee should do once they receive their funding. ATE Central: You've been involved with NSF’s ATE program at a number of levels - initially as a grantee and now, of course, as a Lead Program Director. Can you describe your history with ATE for us? Dr. Carter: I started as an ATE PI with an award made in fiscal year 1997. The project developed case studies with associated laboratory activities around the structure of a biopharmaceutical company. It was not only a very fun and challenging project, but it also introduced me to the ATE community. I was wrapping up that project when one of the Program Officers in NSF’s Division of Undergraduate Education (DUE) left for a job on the House Science Committee. Elaine Johnson, PI of the ATE-funded Bio-Link Center called me at my home institution and told me I needed to call Duncan McBride at NSF. Elaine explained that she thought I would be a great Program Officer and she had told Duncan (her Program Officer for Bio-Link) about me. I did call, and Duncan had me fly to Arlington to interview. They offered me a position as a rotator (a non-permanent Program Officer) in the DUE. I worked in DUE from 2001-2003, surviving 9/11, the Anthrax threat, and the snipers – I did have many people asking me why I stayed! I returned to my home institution in California only to be asked back again as a rotator. That rotation lasted only a year as Liz Teles informed me that she would be retiring and she thought I should apply for a permanent position at NSF and take over the ATE program. That is exactly what happened, and this October marks 8 years for me with the NSF as DUE Lead Program Director for the ATE program. Posted by Madeline Patton on September 5th, 2017 at 7:00am . Beginning in 2018, a few qualified members of the ATE Community will serve each year as Mentor Fellows. The individuals selected as Mentor Fellows will receive financial support and guidance as they engage in activities that prepare them to be Mentor-Connect mentors for potential ATE grantees. The fellowship program is one facet of Mentor-Connect's regenerative leadership development effort. The main thrust of Mentor-Connect, an ATE project of the South Carolina Advanced Technological Education Center, is diversifying the two-year colleges and educators who obtain ATE grants. Mentor-Connect mentees are faculty from two-year, associate-degree-granting institutions that are eligible for Small Grants for Institutions New to ATE. Mentor-Connect leaders plan to offer three fellowships during 2018 to individuals who are interested in eventually serving as Mentor-Connect mentors. Those selected as fellows will shadow experienced Mentor-Connect mentors as they guide two-year college educators through Mentor-Connect's nine-month process for preparing competitive proposals to the National Science Foundation's Advanced Technological Education program. Nominees must have three-to-five years of involvement in the ATE program and recommendations from two current ATE principal investigators or co-principal investigators in addition to the nomination from another member of the ATE community. Experience developing projects and writing grant proposals for the ATE program is a key qualification. Fellows receive a stipend of $1,750 plus travel support to attend two Mentor-Connect workshops. The application and details about the fellowship opportunity are available at www.mentor-connect.org. Mentor Fellow applications are due by 11:59 p.m. EST, September 30, 2017. Posted by Rachael Bower on August 23rd, 2017 at 1:33pm . Based at the Teachers College of Columbia University, the Community College Research Center (CCRC) conducts research on the issues affecting community colleges and works with colleges and states to improve student success and institutional performance. In July 2017, the CCRC released a new ten page research brief titled What Do Students Think of Guided Pathways?. In this report, 149 students at the City Colleges of Chicago (CCC) were interviewed about their experiences with a new guided pathway tool and how it has influenced their studies, their plans for the future, and whether or not it’s actually helping them stay on track in terms of their educational goals. ATE Impacts is also a book! Copies are available upon request or at the ATE PI meeting in Washington, DC. Have an ATE story to tell? The ATE Impacts blog is licensed under a Creative Commons Attribution-ShareAlike 3.0 License. You are free to share, copy, distribute, transmit, and adapt this work, provided you attribute it to the Internet Scout Research Group. If you alter this work, you may distribute your altered version only under a similar license.